Seattle-based experimental haven Debacle Records have been hosting a bi-monthly club night dedicated to “psychedelic dance” since 2012. Known as MOTOR, the event has been successful enough to warrant its own offshoot label, which began releasing a series of 12” singles last year. The first two showcased artists native to Washington; now, the label is looking further afield with an EP from Montreal-based duo The H.
The H are Debacle artist Francesco de Gallo (of noise act Hobo Cubes) and minimal techno producer Jesse Osborne-Lanthier. Their evocatively titled Sewer Club EP unites their respective talents, merging delicately embellished sound washes with thudding techno beats. A-side “Bass Und” is an extended churn through several industrial-tinged vignettes pinned between wavering clouds of ambient noise. Constantly shifting drum textures propel things forward, but halfway through the beat drops out for a lengthy two-minute stretch, revealing eerie electrical discharges–the sound of a bug zapper humming on a darkened porch. When the bass thud kicks back in, sounding just a smidge off-beat, it gently tugs the track to a natural and soporific conclusion. “Bass Und” seems equally intended to alienate and elevate, tethering its more ethereal elements to an intermittent dance-floor beat. The effect is muddled, blurry, and heady, like a night out that you’re already forgetting. 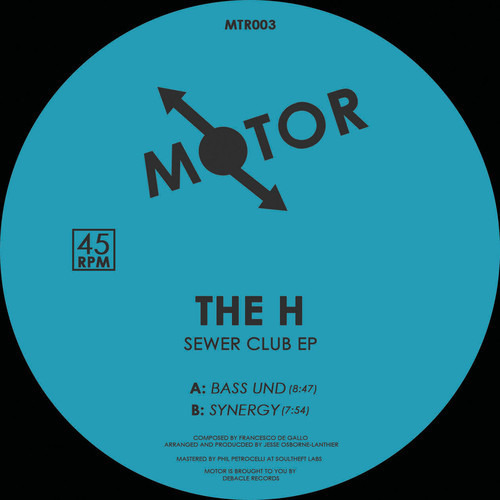 The H's Sewer Club EP is out May 13 on MOTOR.